See what is on your Mac and who owns it. Is there a better alternative to DirectCheck? Is DirectCheck really the best app in File Management category? Will DirectCheck work good on macOS 10.13.4? 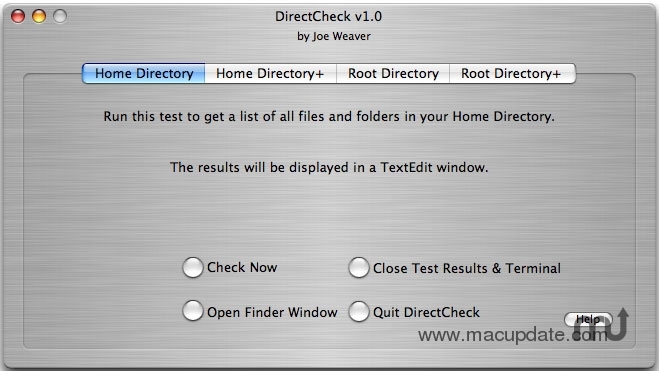 DirectCheck is a system utility used to see exactly what is on your Mac and who owns it. DirectCheck allows you to see what folders and files are in your Home Directory or Root Directory. DirectCheck provides you with a new TextEdit document showing the ownership, size, date and time it was last edited, and name of each file. DirectCheck needs a rating. Be the first to rate this app and get the discussion started!